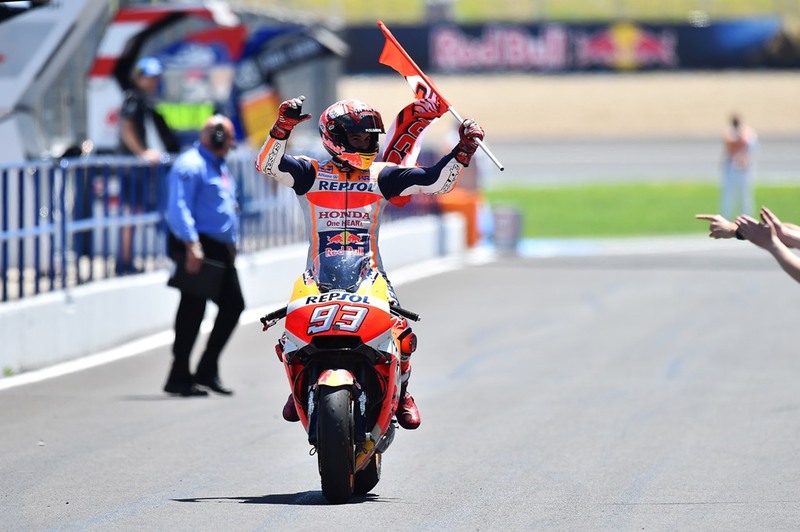 Michelin made history as it secured its 400th premier class Grand Prix win as reigning World Champion Marc Marquez raced to a victory at the Gran Premio Red Bull de España at Jerez in Spain. 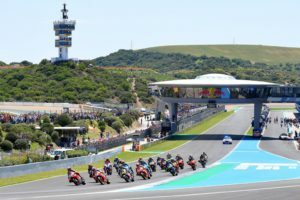 The Circuito de Jerez – Angel Nieto provided the perfect backdrop for the celebrations as an enthusiastic and noisy crowd filled the hillsides surrounding the 4,423m track. Cal Crutchlow made another piece of history in Saturday’s qualifying. Then he produced the fastest two-wheeled lap ever recorded around the Jerez circuit, which also gave him Pole Position for the 25-lap race, an event which took place under clear skies and with a track temperature of 45°C. As the lights changed to signal go, Jorge Lorenzo took an early lead. He held it until lap eight, when Marquez passed him, a move that would eventually lead to the Spaniard taking the victory. The warm conditions and new asphalt led to many late tyre changes on the grid. The riders and Michelin Technicians tried to gauge the best selection for their respective riders. From the six different compounds of slicks available to all 25 riders, five were in use in varying combinations. Only the soft rear did not make an appearance. As the race wore on, Marquez pulled clear at the front. An intriguing battle for the other podium places ensued. Lorenzo, Andrea Dovizioso and Dani Pedrosa vying for the all-important positions. Unfortunately, this battle was brought to a premature end when the three collided on lap 18. All of them crashed. Luckily all were without injuries despite the spectacular collision, but the trio were all forced to retire. This led to Johann Zarco inheriting second. He held it until the chequered flag and rewarded him with the honour of First Independent Rider. Third place went to Andrea Iannone after a thrilling last lap battle with Danilo Petrucci. The three men on the box showed the extensive range of Michelin slicks that the riders used. Marquez went with the hard front and medium rear, Zarco choose medium and medium, whilst Iannone opted for a medium front coupled with a hard rear. This choice and ability to give all riders the optimum selection received further emphasis with four different manufacturers – Honda, Yamaha, Suzuki and Ducati – filling the first four places. This was the first time Michelin had visited the Jerez circuit since it was resurfaced. But two valuable tests had provided important data to enable the company to plan for the race and supply tyres. 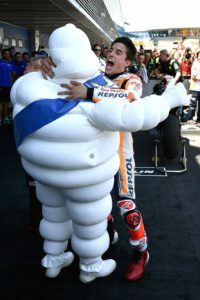 To begin the 400th Victory celebrations, a surprise guest was waiting in Parc Ferme to welcome the top-three and give Marquez a specially embroidered Michelin cap. Bibendum appeared from behind the scenes to greet the three returning racers and join in the festivities. That was the first time that he had appeared at a MotoGP podium celebration.